Aside from the plethora of pens I have laying around to review, I have so many notebooks that I am running behind on. Bryan got that ball rolling for me last week, and I am picking it up this week with the Behance Dot Grid Cahier. This is one of those notebooks that grabbed me the first time I saw it online and I knew I would have to pick some up. My wife bought me a two pack this past Christmas from Barnes & Noble (I'm not sure they even stock them anymore), and I have been very happy with it so far. 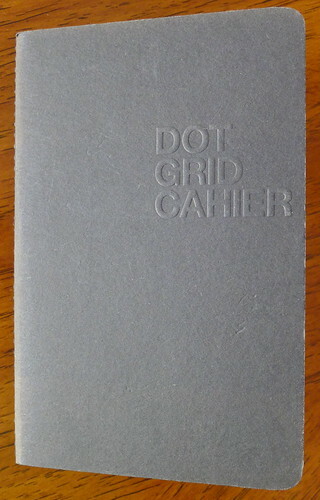 One of my favorite things about the Dot Grid Cahier is the size. 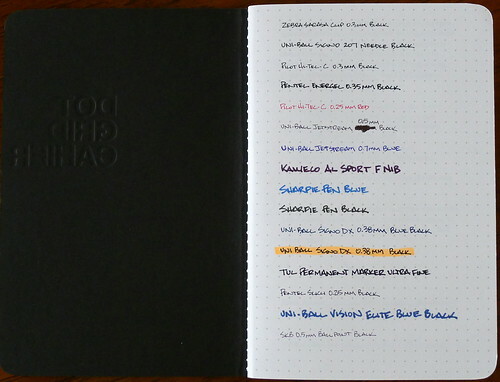 Most notebooks in this category (Moleskine Cahier, Field Notes, Doane Paper Utility Notebook) are 3 1/2" x 5 1/2". The Behance model checks in at 4"x6" and for regular every day use I like that size better. I still use the Doane as my back pocket notebook because of its size, but the Behance gives just a bit more writing room overall. Behance chose to use 60lb New Leaf 100% recycled paper, which I had never used before, but it does a nice job. It is not as smooth as Rhodia paper, but it handled every ink I threw at it nicely. Gel and ballpoint inks were the best, while the liquid ink pens had a slight bit of soak into the page, but didn't bleed or show thru too badly. What I haven't been able to figure out yet is how to approach the dot grid layout. Being the huge fan of regular grid paper that I am, the dot grid is visually appealing to me, but doesn't feel as functional. When I write, I get the feeling that I am lost on the page. I can see a ton of uses for this though, but I couldn't personally use it for straight journaling. To do lists, brainstorming, or what it is intended for - the Behance Action Method - would be nice fits though. It is a notebook definitely worth giving a shot. 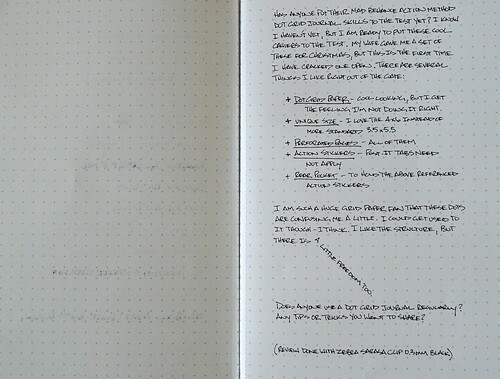 Posted on June 6, 2011 by Brad Dowdy and filed under Behance, Dot Grid, Notebook Reviews.